For the first time in my painting career, I used a GW Foundation paint. Gasp! I know some of you all have been using them since they came out, but given my Dinosaur like nature, I'm slow to adopt new things. It took me months before I even thought about buying the new GW washes. Honestly though, I'm not impressed. In fact, I found it a bit difficult to use. It was like painting with white (PVA) glue. Sure, it covered in one coat, but trying to get that stuff on the model gave me nothing but problems. And... I had to go back with a second coat that was thinned with water to get a smooth finish. I only used the GW Foundation Tausept Ochre on the door icons on this model. Thank goodness I didn't have to use the stuff on the whole model. I only own about 4 or 5 regular GW paints at this point. Actually I just bought two more regular colors the other night for the Storm Wardens project since I wanted my colors to match everyone else's. If I could have gotten away without buying them, I would have gone that route. I normally use whatever it takes from whatever paint line it comes from. The main reason is, I despise mixing colors. I'll mix them for spot application on one model here and there, but I absolutely refuse to mix a color to be used on a number of models. I'll go buy something that is close before I go through the trouble of mixing. Yes, I am that lazy. Almost all of my colors are your basic craft paints. Americana and Delta Ceramcoat are the ones I use most of the time. They're almost like GW foundation paints that have been thinned down a bit with water. Sure, some of them are transparent and semi-transparent, but that's yet to be a problem for me. In some cases, the transparency has actually helped with certain techniques. In the end, I don't think it matters what kind of paint you use. Some paints will require certain "methods" of application for maximum effect, but as long as you're making the effort to get your stuff painted, that's all I can really ask for anyway. Refusing to mix colours to paint lot of models is not to be lazy is to be practical, I do exactly the same, and I usually find the right colour in the vallejo or citadel (or both) pain lines. Three cheers for cheap paint! "In the end, I don't think it matters what kind of paint you use." Seriously though, there are differences in the paint lines. For example, I find GW makes the best black and white of all the miniature paints I've tried. @Tom - Check out P3 there Black and White is much better and easier to apply then GWs, at least in my experience. @Ron - The GW foundations need to be thin for proper application. They purposely come thick with the expectation they they will be thinned down before use. Personally I do use them to basecoat from time to time, but mainly use them as an additive to increase opacity in historically translucent paints. I tend to stick to just one line of paint and mix colors (can't imagine not mixing actually) to get my in between layers. Currently my favorites are P3 with a few GW metals and the GW washes mixed in. My Howling Griffons were painted using all GW paints though, so in practice I pic the best paint line for the project. I agree with what's been said before, foundations need to b thinned out to be paintable. I myself put like 12 drops of water in each pot when i buy them, then periodically put a few more drops in as needed to account for thickening in the pot. that usually brings them down to a milky or like a 5w30 consistency, which actually is right were they should be. from here coverage is superb and its very solid colors, no translucency. Just wanted to agree what with Jay's saying here. 2) that Foundation paints aren't usable straight from the pot. Not without some severe thinning down. Thinned down, I think they're great, they provide fantastic coverage and have really nice, nuanced tones. As to cheap paints vs. "hobby" paints... for the most part, they're interchangeable. I've found a very big difference in how they behave when being pumped through an airbrush, however. The hobby paints (especially the Foundation paints) work really, really well while the craft store paints require more work. Everything I paint these days generally involves me working with a wet brush. The paint flows nicer, blends better and gives a sharper tip to the brush. Usually I keep a small lid or two (darks and lights) nearby full of water to dip my brush in as I paint and an eye dropper in a small bottle provides me clean water. And yes, the foundation paints especially do need to be thinned. I'm pretty happy with most citadel paints when they're not releasing lines that dry to the core in a closed bottle in 2 weeks. "I found it a bit difficult to use. It was like painting with white (PVA) glue." Foundation paints MUST be watered down. They should never be used straight from the pot. Wow thanks guys, these posts have really helped me... I have never watered down my foundations and I bought the entire line. I use them almost exclusively except for about 10 other paints I use as well. I really like foundations, and I have been very pleased with the coverage on black primed models. Colors like Mech Red go great onto the black w/ no problems. However, I have been wondering lately now that I am getting used to using them, why they are so thick... This answers my question now. I was just afraid of ruining my paint like I have in the past by watering it down. Also in reference to Lord Inquisitor Lucas, foundations do need to be watered down, and I see that, but 12 drops is a lot of water, and it seems like a risky business to add that much water to your paint. 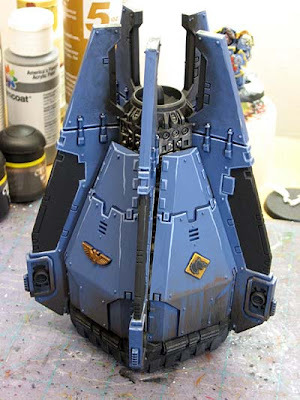 I think I actually forgot to ask first time round but what colors did you use for the Space Wolf color on that Pod and how did you highlight it? I'm not sure if I'd thin my paints by putting water directly into the pots. Instead, I have an old brush that I use to dollop out some paint onto a wet palette (Google for directions on making one; they're really worth it) and thin it with a drop or two of "stuff" from an empty dropper bottle that I filled with a mixture of water and mixing medium. See, I'm not as involved as you guys. I don't add anything to my paint other than a little bit of water every now and then. 99 percent of the time, I paint straight from the bottle. I do appreciate hearing all the different ways you guys go about painting though, makes me wonder if should be doing more to my paints before using them. Hal'jin: The base color on the pod is Shadow grey according to the pot of paint he gave me and I think the highlight is his own mixture... it says "mixing pot" on the side of it so I have no idea what I'm using. I would tend to agree with everyone else's comments. The only paints I ever use straight from the bottle is Reaper Master Series paints. However that is only when base coating with them. Most of my GW Stuff has had water added to the pots from the get go. Quick question though. I have had two pots of foundations get tiny little lumps in them now, despite being shaken daily (like there were paint flakes or plastic filings added to the pot??!?). Anyone else have this problem? It has happened when I have about a fifth of the pot left in two different colours (Necron Abyss and Charadon Granite), these were like the third pot of each and the others never did it. Other than that I can say for certain that P3 Menoth White equals pure win! Hal'jin: The highlight is 50/50 Shadow Grey and Space wolf Grey. Ron is painting the pods for me. Nothing in particular about Liquitex brand, that's just what pick up at Michael's. I find the foundation paints are great for painting colors like red over black. When painting the Ravenwing, I prime black to save time but the weapons are red, so the red foundation paint has come in real handy, as opposed to putting layer upon layer of paint on it. How much, and which I use totally depends on what I want that paint to do that day. wet blend? liquitext slo-dry. Airbrush? Screen wash/water 1/1. just normal paint thinning? Water/Klear 5/1.. I found that straight from the pot paint behaves universally horribly. Thyat said there are (a million) two main approaches to painting. the Watercolour method and the Oil method. now I dont mean the paints themselves, as we all use acrylics here mostly, I mean the approach. The Water colous approach is the only way you can paint with water colous, which is to use dilute, wash like, transluscent paints and paint multiple layers, often painting down from highlits. The oil approach is to use much more viscous, opaque paints and layer lighter colours on top of darker to build up highlights. Now we use acrylics, so in one model, or even one application we can use both of these techniques. 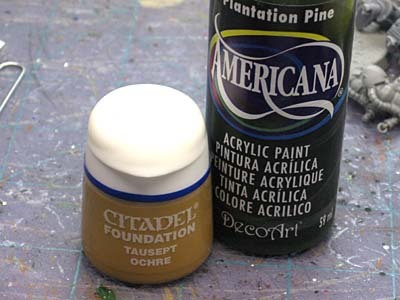 As a last note, I use some citadel paints, and particularly like Iyanden foundation for yellows. but honestly, I usually use Vallejo Model colour for 40k as I like the less saturated colours. Another vote from me for thinning Foundation paints before use - at least one part water to one part paint. I was really stunned to see paints like Charadon Granite or Hormagaunt Purple provide a flawless finish even at a ration of 2(water) to 1 (paint). I'm too lazy to look it up (because it's notoriously hard to find older articles on the GW site) but when the Foundations came out GW gave their customary primer on how to use the new stuff. The article recommended thinning something like 6:1 for basecoats and something like 30:1 if you wanted to use them as a wash. The higher pigment count allows for a great deal of thinning before the mix becomes too thin. With the lighter colors I thin less (though still around a 4:1 ratio) and go over with a light second coat to even out "blotchy" patches once the base coat is dry. For darker colors I thin the crap outta them and they still cover gloriously. @Da_sub: The darker shades will naturally have more pigment and that's probably why you are getting the clumping. I keep a bottle of P3 Mixing Medium handy and use it almost religiously for working with the Foundations (and lately with just about everything). It's basically the liquid that they add the pigments to to make paint so it thins the pigments without thinning the consistency. It works really well with the Foundations and might help you with the clumping if you start adding a bit to the pots when they start to get low. "To get the best results, you'll want to water down your Foundation Paints when you're painting with them. In fact, because of their formulation, their consistency is much thicker than other paints in the Citadel range. The trick is to water down the paint without causing the paint to separate. A good rule of thumb to use with Foundation Paints is to water them down till they are smooth and liquid, after all it's better to paint too thin a layer on than too thick!" If I'm thinning my paint in the pot, I use P3 mixing medium. For thinning on the pallet, I used water that has a very small amount of dishwashing soap in it. @Da_Sub: I think the problem you are experiencing is dried paint. So far, I've only experienced that issue with my first bottle of Dheneb Stone. It could have been a bad batch, but since then I've started thinning in the pot using mixing medium and I haven't had the problem. @Ryan: Consider that Lukas said he added 12 drops when the pot was new. Considering the thickness of foundation paints, 12 drops is hardly a concern. @chaplainaerion & the other Kevin: you could be right, but it seems odd that I would see it with the thrid pot of each. However as I have noticed that there is a distinct difference between batches when I pick up a new pot of each I am going to give give you suggestions a try. I have some mixing medium on hand (I usually use it for good wet blending), and I have to go to Mt Gravatt GW tomorrow anyway so I might as well pick up a couple of pots to try it. I have been adding just de-mineralized water and never had a problem before but I am open to any tips I can get. Has anyone done a comparison test between the quality on thinners, extenders and mixing mediums yet? I wonder if this would be useful for the tutorials/tips section. FYI I usually use "Jo Sonyas" brand additives cause that is what is cheap and readily available from "Riot Art & Craft" locally. As an addendum: Brisbanites Riot is the place to go for thinners and extenders along with a great many other useful things for painting, including better priced Sable brushes! Anon: We don't judge here. I'm still trying to figure what paints I like best. I'll use whatever works to be honest.